NoveList Select for Catalog is there with recommendations when your readers are searching in the catalog—in other words when they need it most. Real time availability of items. Learn more about On The Shelf. NoveList's story elements include appeal terms, themes, and genre. Together, they make up the difference aspects of a book that capture a reader's attention. See a title's AR level and browse by similar AR levels. 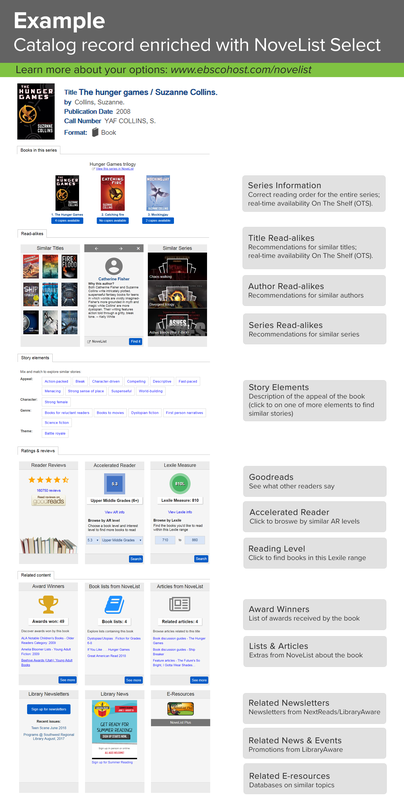 See a title's Lexile measure and browse for other titles in this Lexile range. Pointing patrons to databases on similar topics. Learn more about e-resource recommendations. The features below require an additional purchase (choose your options on the custom quote form). They may not be available for all ILS systems.